14-plus-hour filibuster by killing four gun control bills. In fact, Cruz did a 21-hour-long filibuster against Obamacare in which he read from Dr. Seuss’ “Green Eggs and Ham,” as well as praised White Castle hamburgers, quoted from reality show “Duck Dynasty,” and made references to professional wrestling organisation, WWE. 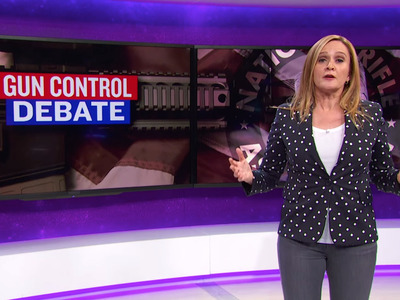 Bee pointed out that Republicans do have a record of supporting gun control in the past. Former President Ronald Reagan opposed the NRA publicly and backed the Brady Bill. Instead, Bee said that today’s Republicans are unabashedly open about being in bed with the NRA or at least parroting its talking points.